SAITAMA CITY, June 16, 2009 - Tamron Co., Ltd is pleased to announce the release of the SP AF60mm F/2 Di II LD (IF) MACRO 1:1 (Model G005), a life-size macro lens designed exclusively for digital SLR cameras with APS-C size image sensors* that offers a fast maximum aperture of F/2.0. The new lens is made available in mounts for Canon, Nikon (with built-in AF motor) and Sony. The SP AF60mm F/2.0 Di II LD (IF) MACRO 1:1 (Model G005), covering an equivalent angle of view of 93mm when converted to the 35mm format(*1) and boasting a maximum aperture of F/2.0-one stop faster than the F/2.8 maximum aperture found on conventional macro lenses in the same class-is a fast life-size macro lens that delivers dramatically attractive blurred background effects. Macro lenses are interchangeable lenses that have been specially designed for close-up photography. With a macro lens, even a small object can be photographed at a size that fills the whole image area. Macro lenses can be used for nature photography, such as plants and insects. They can also be used for close-up photography of familiar items such as jewelry and other small objects. In addition to its close-up capabilities, the new Tamron SP AF60mm F/2 Di II MACRO 1:1 can also be used for portrait photography, making good use of the attractive blurred background that is a feature of the fast F/2.0 maximum aperture lens. The lens also excels in situations where light is low, such as indoors or at dusk. All in all, this is a high performance lens that can be put to good use in a wide variety of situations. (*1)  Tamron's conversion value is 1.55X. * Life-size: For digital cameras, this means that the lens is able to project onto the image sensor (which corresponds to film in a film camera) an image of an object that is the same size as the object itself. * Di II lenses are designed exclusively for use with digital SLR cameras equipped with APS-C size image sensors and employ an optical system optimized for the characteristics of those digital cameras. Di II lenses are not designed for use with 35mm film cameras or digital SLR cameras with image sensors larger than 24 x 16mm. * The special note "APS-C size equivalent" is hereinafter omitted. Tamron's macro lenses (SP AF90mm F/2.8 Di MACRO 1:1 (Model 272E), SP AF180mm F/3.5 Di MACRO 1:1 (Model B01) are world renowned for their outstanding optical performance. Particularly, the Tamron SP AF90mm macro lens first introduced in 1979 and subsequently upgraded and renewed seven times since has been highly evaluated by many photographers as a lens that delivers not only attractive out-of-focus effects and sharp descriptive performance in macro photography with its easy-to-use focal length, but also as a lens ideal for portraiture. Amid the growing popularity of APS-C size DSLRs, Tamron recognizes that there are many photographers who wish to enjoy macro photography with a focal length that provides an angle of view equivalent to 90mm. 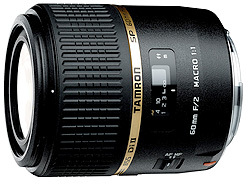 Tamron therefore developed the SP AF60mm medium telephoto macro lens to meet the desire of those users and goes a step further by providing the extremely fast and desirable maximum aperture of F/2.0. The SP AF60mm is a high performance and versatile lens that is suitable not only for macro photography of textiles, small creatures, flora and more, but also for portraiture by making good use of its easy-to-use focal length, fast maximum aperture and high optical quality even in low-lit conditions. The SP AF60mm is a medium telephoto macro lens designed for APS-C size digital SLR cameras that realizes the fast maximum aperture of F/2.0 for the first time in the world(*2). Using an optical design approach that attaches methodical importance to optical quality, Tamron's optical designers have successfully controlled complex movements of respective lens groups in order to restrain the increase in aberration changes due to the fast maximum aperture, thus achieving outstanding depictive performance that is uniformly sharp from the center to the periphery. Since the maximum aperture of F/2.0 provides a depth-of-field that is shallower than that of conventional F/2.8 lenses, the new lens enables the user to expand the range of the macro photographic expression. The SP AF60mm developed by combining Tamron's accumulated macro lens design know-how is an attractive lens that maintains a well-balanced relationship between sharp image performance and beautiful out-of-focus background effects. The lens employs two large LD (low dispersion) glass elements in its first group to thoroughly compensate for various aberrations and attain high optical quality. Tamron has realized the long working distance of 100mm from the front element of the lens to the subject in 1:1 life-size macro photography. The long working distance allows the user to take macro shots while maintaining a sufficient distance from such subjects like timid insects that are likely to escape if you move in too close. Also, with this longer working distance, you can prevent capturing the shadow of the lens barrel as is often the case with conventional macro lenses with insufficient working distances. Tamron employed new BBAR (Broad-Band Anti-Reflection) multi-layer coatings in order to ensure optimum performance in all photographic situations. The new BBAR coatings enhances the light transmission factors in both the short and long wavelength ranges, a condition that was thought incompatible with conventional anti-reflection coating technology. In addition, Tamron employs internal surface coatings (coatings on cemented surfaces of lens elements) for sharpness, high color reproduction performance and superior color balance. In order to prevent the lens from becoming bulky due to the fast F/2.0 maximum aperture, Tamron's mechanical engineers thoroughly reviewed the internal constructions of conventional macro lenses and improved the accuracy of precision components by combining Tamron's accumulated mechanical engineering techniques. Through the employment of precision injection-molded engineering plastic parts with high reliability, Tamron realized a compact body that measures only 73mm (2.9in.) in its maximum diameter and weighs a mere 400g (14.1oz.). The lens employs an internal focusing (IF) system without changing the overall length of the lens due to focusing. Since the front group of the lens does not extend, the lens is particularly easy to use in close focusing ranges. Tamron has realized the working distance of 100mm, the longest distance among lenses in this class(*4). The internal focusing system combined with new optical solutions to realize this longer working distance allows the user to enjoy macro photography comfortably while maintaining an adequate distance from subjects. The lens incorporates a full-time manual control mechanism that enables the user to manually adjust focus without engaging the AF/MF switch-over button, even when in the auto-focus mode. The lens employs a new outer design that is more refined and smoother in its overall contours by minimizing concavity, convexity and variations in its profile to match various digital SLR cameras. The lens barrel features a delicate matte finish, which enhances the high quality appearance of the lens. * The values given are the lens for Nikon. * The cosmetic design, specifications and performance are subject to change without notice.